Do the Bears even still play in Chicago? I mean, what with the continuing after glow of the Cubs World Series win, the continued excellent play of the Blackhawks and the surprisingly resurgent Bulls, the Bears are easily the redheaded step child of the Windy City sports family. Of course, rampant injuries like that to much-maligned QB Jay Cutler, PED-induced suspensions to multiple key players and the stagnation of the John Fox/Ryan Pace led rebuild haven't exactly helped the franchise's relevancy. The future isn't looking particularly bright either, with the development of key young guys like Kevin White and Kyle Fuller hitting stumbling blocks. As such, one has to dig into the past to find anything remotely worth talking about when it comes to the Monster of the Midway. When it comes to baseball, I'm always gung-ho about cards that feature extra infielders, lefty specialist and other 25th man type players; thus, it's only appropriate that I be most excited about crossing a pair of vintage kickers off of my football needs list. 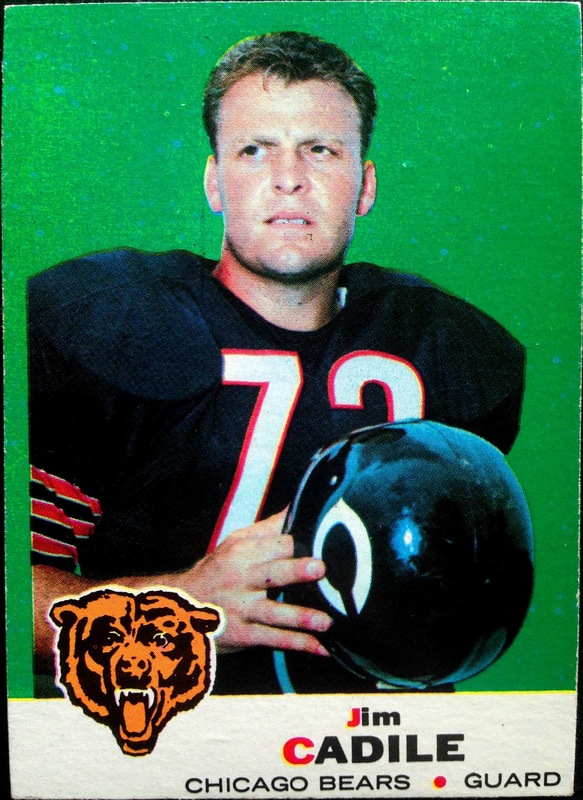 Roger LeClerc was a linebacker in addition to being Chicago's primary kicker in the early 60's. Most notably, he kicked the winning field goal in the 1963 NFL Championship Game against the New York Giants. 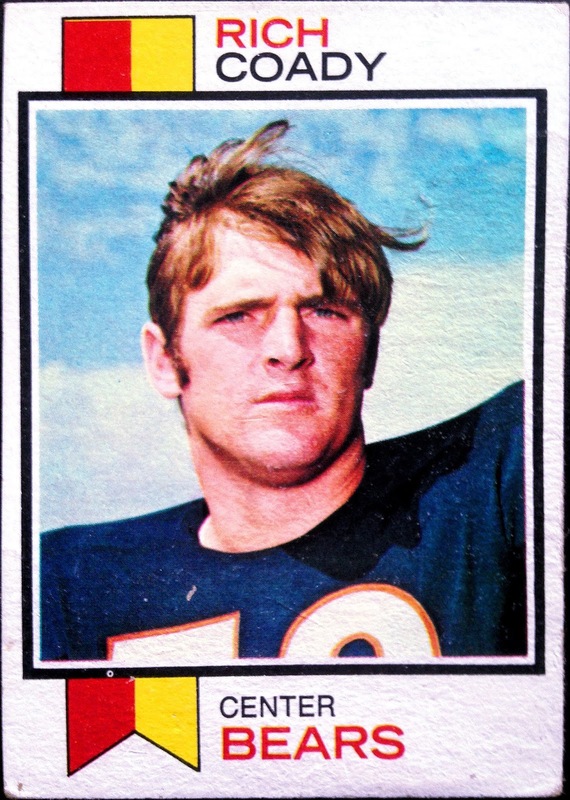 Meanwhile, Percival was acquired by the Bears to replace LeClerc in 1967 and stuck around through the '73 season. 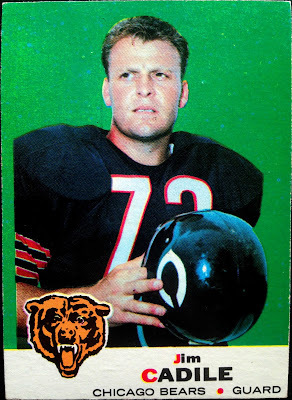 He is the last Bears kicker to make five field goals in a game and is known for his basketball career at Texas Tech, where he never played a down of football. Here we move from special teams to the offensive squad with a guard and a center from the days of yore. 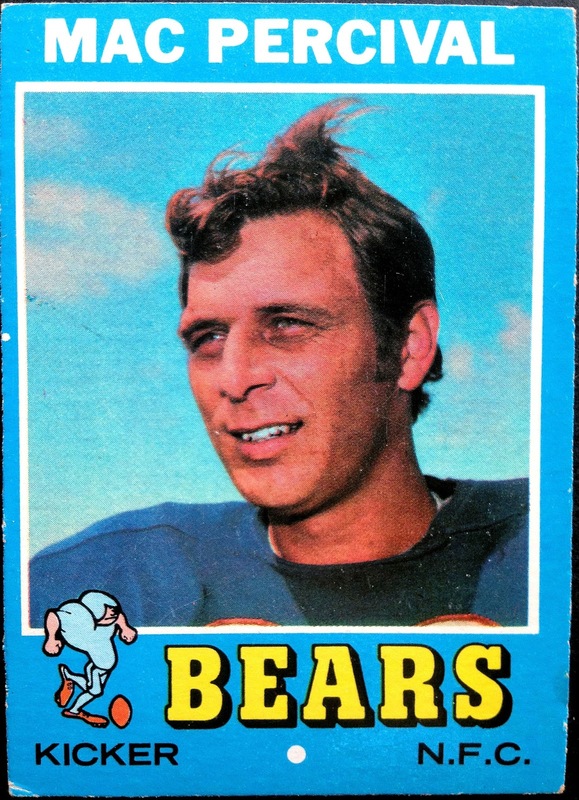 Jim Cadile stuck around the Windy City from his being drafted out of San Jose State in 1962 through the 1972 season - a full decade with the Monsters of the Midway, opening holes for names like Sayers and Piccolo. With LeClerc, he was part of the Bears squad which won the pre-Super Bowl NFL title in 1963. Rich Coady wasn't yet around at the time that occurred, but the hometown kid probably cheered from home. The Second City native eventually suited up for his local heroes from 1970-74, playing in 67 games along the way. Now, we flip to the other side of the ball, courtesy of one Dave Whitsell. 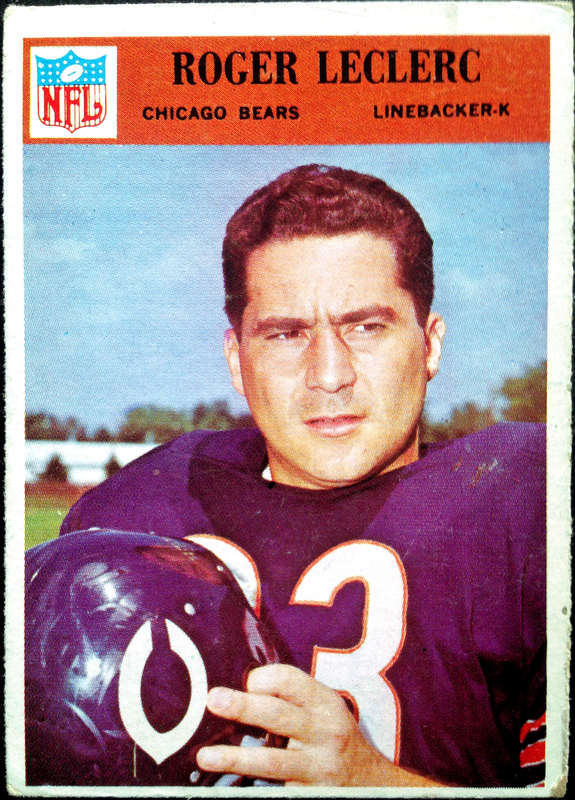 Sporting my favorite number, 23, and one that's done well in Chicago sports (Sandberg, Hester, Dye), Whitsell dressed as a defensive back from 1961-66, making him the third member of those '63 Champions to appear in this post. Prior to the '67 season, Whitsell was lost in the expansion draft to the New Orleans Saints, a fact that you might have already caught if you looked closely at the above card. A topical one too, since Orlando Pace was inducted into the Hall of Fame this summer. I was lucky enough to pull this shiny, Pinnacle single of Pace from an impulse purchase of a Dollar Tree repack. 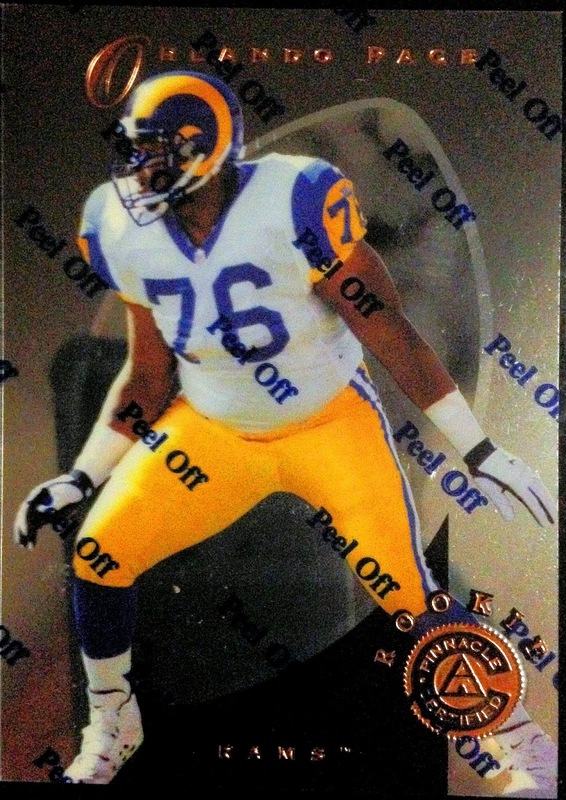 Of course, "The Pancake Man" is enshrined in Canton for his exploits with the St. Louis Rams; however, let's not forget that, in 2009, Pace finished up his storied career with a single season in Chicago, a stint which ended prematurely due to injuries. 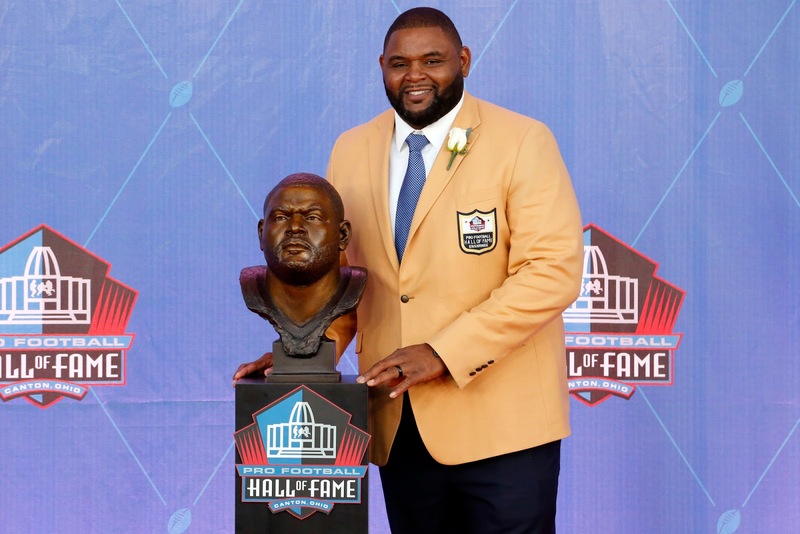 Controversially, during the broadcast of Pace's acceptance speech, the NFL cut out the portion which thanked St. Louis fans, the city from which his Rams abandoned for LA this offseason. The NFL seems to have fists permanently made of ham. With that, we've seen the extent of my football additions so far during football season. Like I said, it's kind of hard to get into the gridiron with the backyard tire fire that is the 2016 Chicago Bears. However, cheap vintage football cards are always going to catch my attention, regardless of the team's standing. 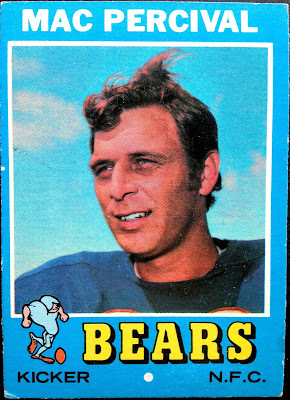 My Bears collection is severely lacking pre-1980. As great as reminiscing with the 1963 NFL Champions was, here's hoping that the current iteration of the franchise can get this thing turned around in the next couple years. In the meantime, I'll gladly keep my focus on the perennial Stanley Cup contenders that are the Blackhawks. After all, Ryan Hartman and Co. are much more fun to watch. 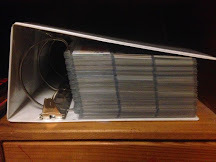 I don't get to see that many games here in exile. Just as well. I do get most of the Blackhawks games (not the GN ones). "We hope you enjoyed the broadcast. We know you enjoyed the outcome." 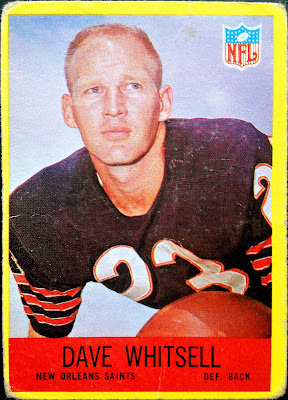 I think Whitsell led the NFL in interceptions in 1967 with the expansion Saints.